By Ashutosh KS in Internet. Updated on May 22, 2018 . Music is the soul of life. That’s why there’s so much music being created, shared, listened to and even available for free download. The music industry is producing a lot of high-quality stuff but quality platforms that host such music are only a few. And in this post, I’m listing the best of them. Here’s a post featuring the best online services to share and listen music. These platforms host all kinds of music with advanced features to give you a complete music experience. You’ll also find a gamut of features to save a share your favorite music on these services. Take a look at the following list for more details. Spotify is a popular music streaming service that allows you to experience hi-fi music through a user-friendly interface and additional features. The service is available for numerous platforms – including Xbox and PlayStation. Moreover, it is regularly updated and is free to use, but you will find better features in its pro version. What I find interesting is, every week it releases a two-hour long playlist named ‘Weekly’, which recommends incredible tracks. You can search music tracks and discover ready-made playlists for every mood – all in high-quality audio. Also, you can create individual collections, which you can after that share with your friends and family. Most of its impressive features (except ‘Shuffle play’) come for a price. Its free version devoid you of high-quality music experience and lacks unlimited skips and offline music as well. Also, Spotify isn’t available in certain countries like China and India. Pandora is an internet-based radio station, that boasts of a one-of-a-kind music analysis and recommendation engine that evolves as per your preferences. Unlike Spotify, it works only on Android, iOS, Windows, and the web; but like the former, it is free with ads. What I liked about Pandora are its unique personalization features. It takes into account the artists or the songs you listen to and creates a music station for you – a custom station personalized to your liking. Also, its AMPcast service allows artists to record and release audio messages to their entire fanbase along with links to tickets, new music, etc. Unfortunately, Pandora is only available in the US. Also, most of its competitive features like ad-free music, option to skip songs, etc. are part of its premium plan. Google Play Music works as an online service to stream and store music. You can access your music library at any time, via any device, with or without an internet connection. Like the above two services, it is also free, thanks to ads. However, unlike Spotify, Google Play Music is only available on Android, iOS, and the web. You can upload up to 50 thousand songs and access them from any device. That means you can use it to create your unique music cloud and that too, at zero cost. You can even listen to selected radio stations, which play endlessly to match your mood and situation. Moreover, you can create and save playlists as well. It offers some features like ad-free music streaming and downloading music tracks to access them offline as a part of its ‘Unlimited’ plan that requires payment. Apple Music is a favorite music streaming application amongst Apple fans. It offers a catalog of 45 million songs and works with iTunes app on Android, macOS, iOS, Sonos, Windows, and the web. Unlike the above music services, it does not offer a free plan, but you may find a trial option from time to time. 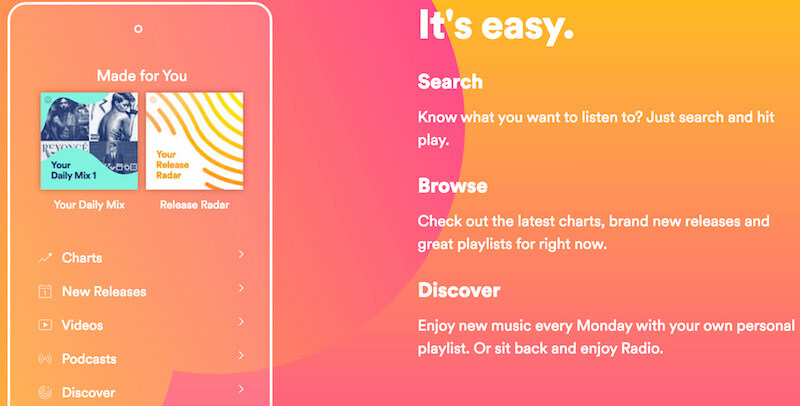 Apple Music also features the latest music releases, curates unique playlists every day and allows you to create your playlists, profiles, and follow others to share music. You can also download music tracks from Apple Music and access them offline on your device. Like Google Play Music, it syncs everything in your iTunes library, thus enabling you to see all the music in one place, from any device. 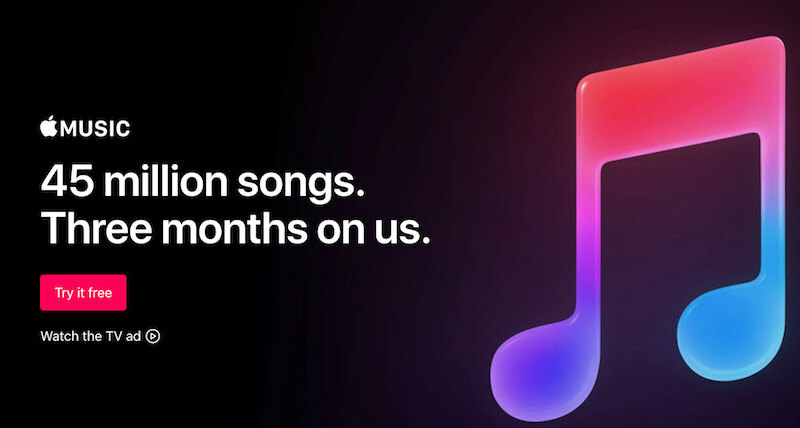 Apple Music gives you a three-month trial period (at the time of writing), and after the trial, you must opt for one of its paid plans to continue using it. 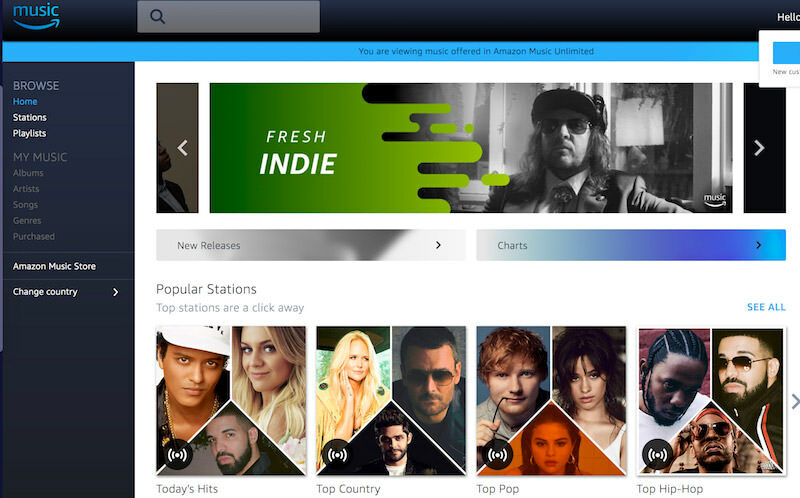 Amazon Music is a comparatively new entrant in the field of music streaming that offers a library of just 2 million songs. It works on multiple platforms including Android, Fire OS, macOS, iOS, Windows, and the web. It comes with Amazon Prime subscription, and thus, it is not free, like Apple Music, but you can get a trial some or the other time. 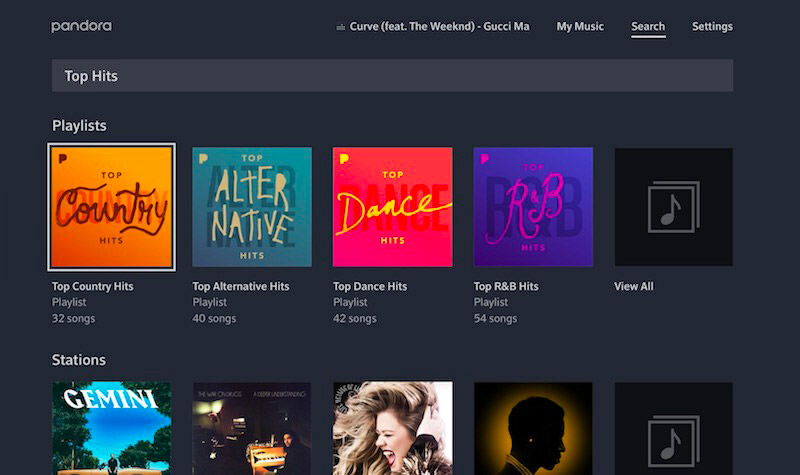 Amazon Music features curated playlists and personalized music stations. Another of its essential features is support for Alexa-powered devices, so you can just say “Alexa, play a song” to listen to music. It also showcases new and popular music releases but does not avail a feature to upload and sync music, unlike above two services. Amazon Music costs you more if you are not already subscribed to Amazon Prime. Also, it hosts a smaller music library in comparison to others (if you have not opted for its ‘Amazon Music Unlimited’ plan), especially Apple Music. Lastly, it mostly comes with a 30-day free trial, after which, you must select a plan to continue using it. 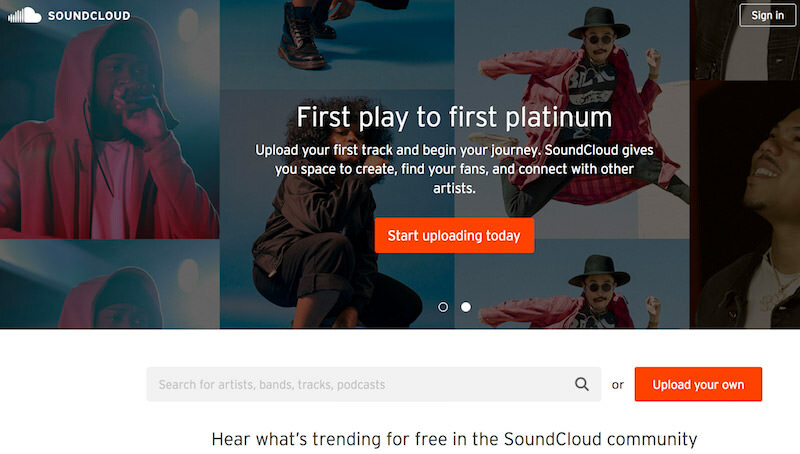 SoundCloud is one of the most diverse and expanding music platforms well-known for emerging artists and their indie music tracks. It is free as some other services on this list and is available on Android, iOS, Sonos, Xbox One, and the web. You can listen to new and popular tracks, create and save playlists, and share them all with your friends and family. However, SoundCloud is more of a social hub for both indie and expert artists that offers to upload and share your tracks with the world – be it original music, remixes, or podcasts. You can also monetize your tracks and gather feedback on them from its community of music lovers. SoundCloud also offers a ‘Go’ plan, which allows you to download music tracks and listen to them offline, like few other services. Its premium versions for artists include more features such as a higher upload limit, robust statistics, and better control tools. Tidal is a giant music and entertainment platform, which is available in 50+ countries. It offers 50 million songs along with more than 200 thousand high-res videos to its subscribers. Moreover, it works seamlessly on the web as well as popular devices such as Android, iPhone, iPad, iPod, Mac, and PC. What I liked about Tidal is that it features fantastic music – especially from its co-owners. It also boasts of hi-fi sound quality, allowing listeners to experience quality music. It comes with a variety of content including exclusive music tracks, videos and concert live-streams. For artists and musicians on its platform, Tidal also offers a ‘TIDAL X’ service that helps them to connect and engage with their fans including live shows and meet and greets. Though Tidal is available for multiple platforms yet its mobile apps are known to be less user-friendly than that of their competitors. Moreover, it does not offer a free plan, but only a 30-day trial offer, after which, you must pay and subscribe to one of its plans. Slacker Radio is internet radio, like Pandora, which specializes in offering handcrafted radio stations for you to browse and listen. It is also free like most services on this list, thanks to ads. It is available for a wide range of platforms like Android, Fire OS, iOS, Sonos, and the web. Slacker features themed radio stations to match your mood on holidays and music festivals. Its custom radio stations are curated to your tastes and preferences like Pandora; however, it is not as good as Pandora at personalizing the stations. Moreover, you can share your music stations with friends and family members to allow them to enjoy your tracks. Slacker Radio preserves the best features for its premium subscribers, which will cost you slightly more than some services on this list. You can access ad-free music, superior audio quality, unlimited skips, and offline music on its premium plan. Last but not the least, it is only available for subscribers living in Canada and the US. 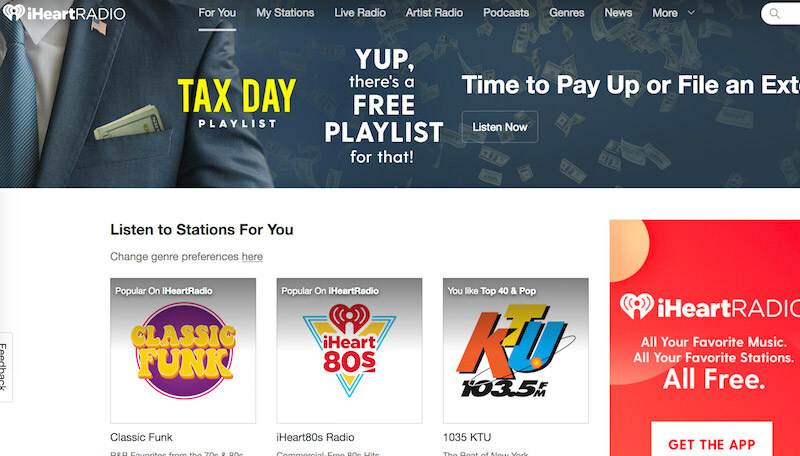 iHeartRadio is known for its enormous collection of podcasts and radio stations. You can also listen to music from this streaming service. It is mostly available for free and supports a range of devices and platforms such as Amazon Alexa, Android, Fire OS, Google Home, macOS, PlayStation, Sonos, Windows, Xbox, and the web. 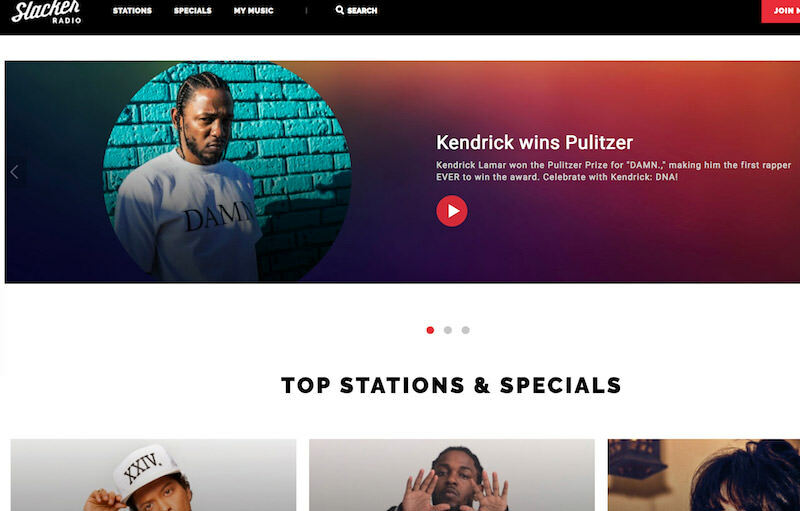 What I found unusual is, iHeartRadio gives you access to thousands of AM and FM stations, which are live or recorded – ranging from the field of comedy, music, news, sports, and talk shows. You can mark the favorites, create playlists, and even personalize the music stations based on your favorite music artists or genres – all for free. ‘iHeartRadio Plus’ and ‘iHeartRadio All Access’ are its premium subscription plans, which include features like zero-ad listening experience, option to save and replay the songs, unlimited skips, and offline music option to listen the music without the internet. 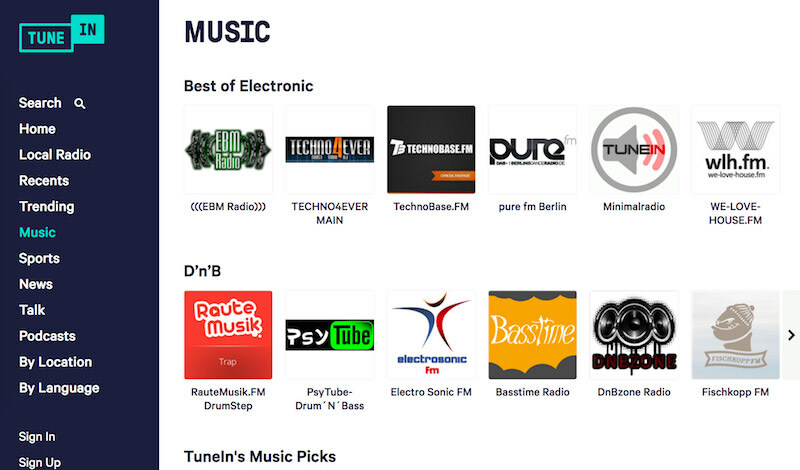 TuneIn is a streaming service that offers music, news, sports, podcasts, and on-demand internet radio stations. Its content is broadcasted live throughout the world, which you can enjoy on an array of platforms including PlayStation 3, Sonos, Xbox One, etc. It is free for everyone, like many others, but comes with commercials. 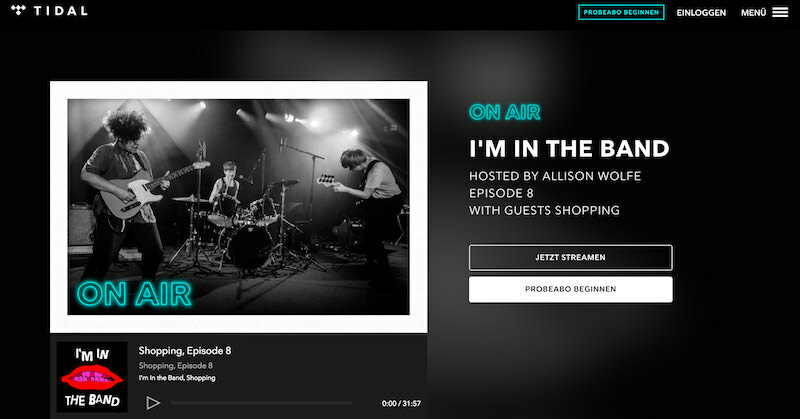 TuneIn gives its listeners the access to 120 thousand radio stations and millions of podcasts. You can listen to live sports events as well as experts’ selections or the personalized suggestions per your mood and environment. Also, you can mark them as favorites. And if you are a music creator, you can even start a broadcast or podcast on TuneIn. TuneIn comes with a premium plan, which once subscribed, gives access to commercial-free music and live sports games. If you stick to its free plan, you only get access to the radio stations as well as today’s best podcasts – not all of the best of it is free.